Refugees from all around Europe including a group of misfit artists found a safe haven in neutral Switzerland one hundred years ago while World War One raged. 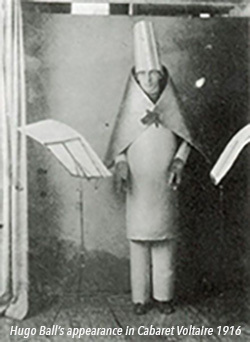 A mix of painters, poets, sculptors and performers banded together and founded the avant-garde art movement known as Dada. Their work would influence the surrealists and modernists in Paris like Miró and some critics say the composers Erik Satie (who worked with Picasso and Cocteau) and also John Cage owed some of their work to the Dada influence which could even later be noted in punk music and the band Devo. 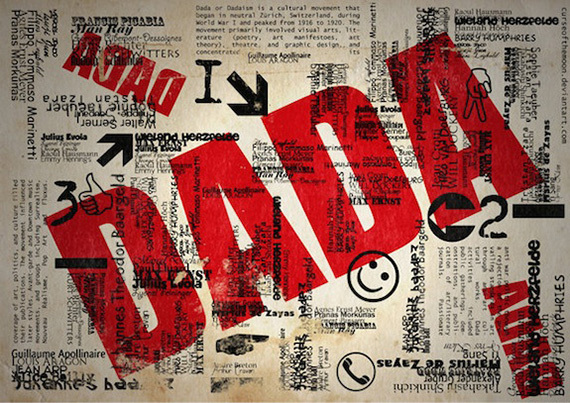 The German poet Hugo Ball introduced the Dada manifesto in July 1916 that was part anti-war and anti-art with a tone of rebelling against bourgeois society and the cultural and political conformity that they believed created the conditions for war. He said: "For us, art is not an end in itself ... but it is an opportunity for the true perception and criticism of the times we live in." Their publicist, poet Tristan Tzara (whose pseudonym means 'sad in country', a name chosen to protest the treatment of Jews in his native Romania) also promoted 'Dada means nothing' to show their anti everything stance was an attitude for minimalism and shedding of the old conventions to create a new ethic. Their home base was a small performance room above a restaurant in the old town of Zurich called Cabaret Voltaire where they gave performances and encouraged a variety of arts including music, sculpture, theater and poetry in a form of protest. Their wild performances are what we would call open-mic today where anyone could present their latest work or create outrageous combinations of expressions. The prime instigator was usually Hugo Ball playing piano accompanied by his girlfriend singing cabaret style. 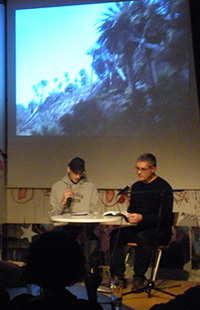 I had a chance to share a bit of the Dada history when the city of Zürich decided seven years ago that it didn't want to fund what they saw as a left leaning arts establishment. The Cabaret organized a campaign to bring the matter to a public vote and I supported their campaign efforts being an artist who likes to help fellow creative types. And when they won the vote to receive funding I was invited to participate in their celebration. Being a bit of a cultural refugee myself having moved to quiet little Switzerland from big bad Los Angeles I was honored to be able to take the stage at the venerable location. (The cabaret is in a 200-year-old building that includes a museum, café and small theater with a bar.) I had a thirty-minute time slot and organized a multi-media show around reading from a work in progress that is now my recently published book Nirvana Blues. A local hip-hop spoken word poet named Sean Byron joined me and we alternated dialogue from the characters with reading sections from the tale. I had a road movie playing in the background me driving along the Pacific Coast Highway from Santa Monica to Malibu with colorful images of canyons and beautiful coastline. One of the subplots in the book is about a rock 'n' roll band who in real life were my neighbors and I'd been graciously allowed to use the words from a song of theirs. I organized a local music producer to make an instrumental version of the song that I would use as a soundtrack for some promotional videos but tonight I had a different purpose in mind. While the music played Sean read the words to the song and then carried on improvising in time with the music with lines that made sense and perfectly rhymed. It was so flawlessly executed the audience at first thought he was still reading from the book. While I was grateful to be able to perform in such a historical venue the best moment of the evening came at the end. Somebody I knew had been taking photos and heard one of the guests at a table in the back say after I had finished: 'Hey, that was really Dada!'. My eclectic performance had received the ultimate compliment in the Cabaret Voltaire as I joined the ranks of the cabarets performers inventing new ways of expression. Authors note: many local events have been organized celebrating this years one hundred years of Dada - click here for details.